The idea of personalized gadgets has led to a booming industry for sellers of cell phone stickers. But as different as you can make your phone look, it’s still someone else’s creation. 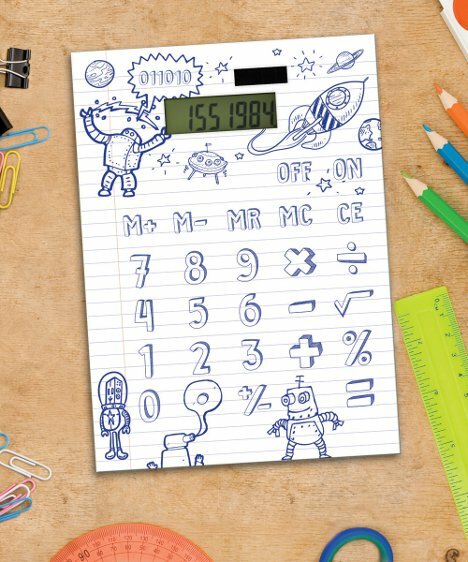 This very unusual calculator satisfies both your creative instincts and your urge to doodle by letting you make up exactly the way you want it to look. The DIY Calculator from gift company Mustard is a fully-functional calculator, but it comes with none of the buttons labeled. It looks just like a blank sheet of notebook paper with a screen and a little solar panel. You can’t change the position of the buttons so you still have to label them in the right places (or, you know, just guess which is which). Other than that, the blank surface is yours to doodle on to your heart’s content. There’s no word on the pricing yet, but the product is labeled as “coming soon” from Mustard.